England were all out for 342 in their first innings on day two of the opening test against Sri Lanka on Wednesday (07). 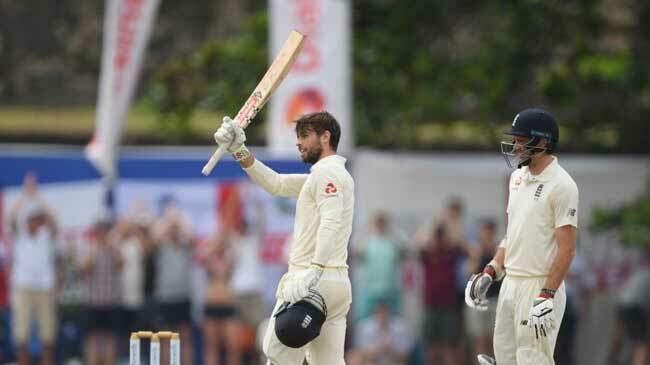 Ben Foakes became just the second England wicketkeeper to score a century on Test debut. Foakes, who was only called into the squad ten days ago after Jonny Bairstow sustained an ankle injury, was still five short of the landmark when he was joined by England’s No. 11, James Anderson. After watching Anderson survive a nerve-racking over from Dilruwan Perera - one ball was played agonisingly short of the packed slip cordon - Foakes decided to seize the moment and took the attack to Suranga Lakmal. After pulling the second ball of the over through backward square for four, he punched the fourth back past the bowler off the back foot - a high-class stroke by any standards - for another boundary to reach his hundred. Matt Prior is the only other England wicketkeeper to score a century on debut. Foakes had started the day on 87. Despite easing the first delivery of the day through the covers for four, it looked like he might have been left just short of his century when Jack Leach was drawn into a back foot push and edged to slip to give Perera his fifth wicket. Leach had earlier taken a single from the fifth ball of a Lakmal over, which left him a whole over of Perera to negotiate. Foakes’ attempt to accelerate upon reaching his century was unsuccessful. Having heaved another Lakmal delivery over midwicket, he was well caught at extra cover as he attempted to hit over the in-field. But, having come to the crease with his side precariously placed at 103 for 5, he had more than done his job in lifting England to a competitive first-innings total. And, by becoming the first England wicketkeeper to score a Test century in Asia, has given the team management a selection headache ahead of the Kandy Test, by which time Bairstow is expected to be available.